Firstly: HOORAY for Easter. It’s one of my favourite times of year. Four no-strings days off, plenty of chocolate, a little religious reflection if that’s your thing, lots of opportunities to bake, and it’s not long till my birthday. 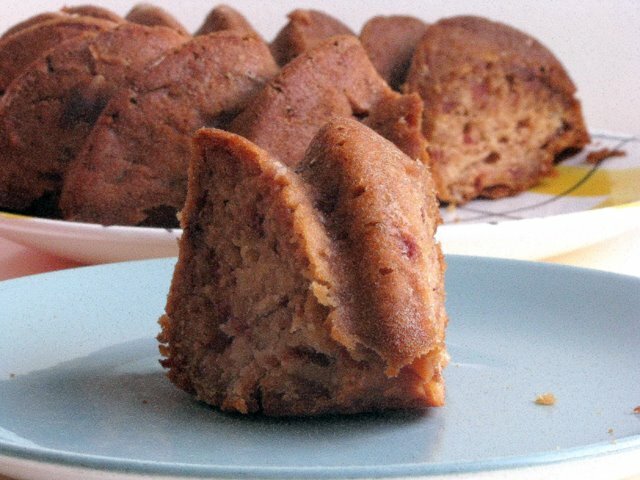 I’ve definitely got hot cross buns on the brain, but before that there’s this seriously good vegan apple cake recipe which I want to share. By the way, I hope it doesn’t annoy any people who genuinely shun meat, eggs and dairy when I go into vegan mode and semi-patronisingly claim, like I’m the first person to ever work it out, how good a particular recipe is. I couldn’t go full vegan any more than I could commit to eating nothing but hot buttered toast. I just like finding fun new recipes. Like this one. I discovered this recipe on Palachinka’s blog. Her version uses grated quince, which sounds mighty alluring, but I decided to go with apples instead to make it an option all year round. It’s the work of minutes (although grating stuff is never fun) and makes a small-ish but really, really good cake. Set your oven to 180 C/350 F. Oil a bundt caketin, sprinkle flour over it, shake it round to coat the inside and then tap out the excess. Mix together the grated apple, oil, sugar, juice and vanilla or cinnamon. Sift in the baking powder, soda and baking powder, mix everything together. Spread into the caketin and bake for about 40 minutes. That’s all there is to it really – a bit of grating, a bit of stirring, a bit of waiting. I have a pretty large bundt cake tin so the cake was only the size of the top bit of it (as you might be able to see from the photos) but it still worked totally fine. Make sure the baking soda is really well sifted, as it gives the cake the push it needs to rise and you don’t want nasty lumps of it amongst the finished product. This cake is seriously beautiful – soft, superlight, and keeps for days. The grated apple kind of dissolves once it’s baked but still provides a bit of body and texture. 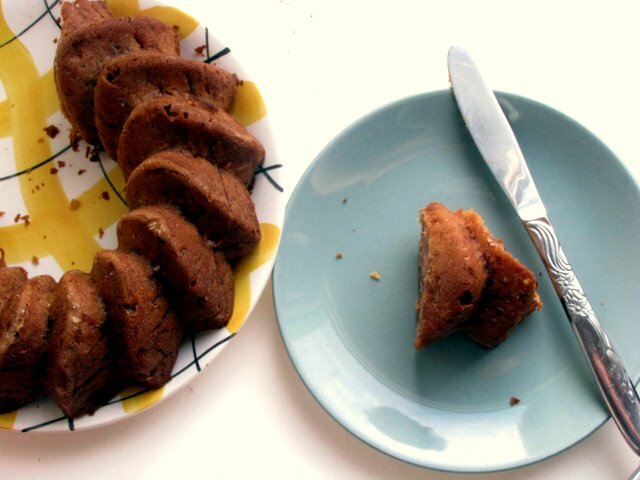 I first made this cake using water instead of juice as the liquid component but trust me, trust me, you need the juice – the cake is okay but a bit weirdly bland without it. The second time, with juice, it was perfect – fragrant and deeply apple-y without being the slightest bit too sweet. I added a spoonful of vanilla paste to add even more flavour but the obvious addition of cinnamon would also be just right. Next time I make this – because there will definitely be a next time – I’m going to try adding a handful of shredded coconut for a bit more texture and flavour. I also have a feeling that grated carrot instead of – or indeed, with – the apple could be really cool. In the meantime, it’s gorgeous just as it is, great with a cup of tea and full of enough good stuff that you could probably eat it for breakfast. I don’t have much of an agenda this Easter – which is actually really nice – it just feels so ridiculously good having four days to relax. Especially since, O Easter Miracle, Tim got three of the four days off. We’ve watched lots of DVDs and have nearly finished Season 5 of The Wire, which, without wanting to sound like our lives are pitifully narrow, is a pretty momentous occasion. We bussed out to Lyall Bay today and attempted to walk along the beach, getting exfoliated by the sand whipped along by the brutal wind. That said, the feeling of sand underfoot and the sight of giant seagulls flying sideways is never wrong. We had an amazing late lunch (Tim: salami, cheese, tomato and gherkin sandwich, Me: brocolli, blue cheese and walnut pie) at Queen Sally’s Diamond Deli, and bought cut-price yoghurt from the Reduced to Clear shop. Finished up back on Cuba Street sharing a hokey-pokey flavoured thickshake and playing Go Fish at Offbeat Originals. Tonight I’m making hot cross buns, which will rise overnight in the fridge and go into the oven first thing tomorrow morning. I wish it could be Easter every weekend! Title brought to you by: Madonna’s Like A Virgin from her album of the same name, and while there’s nothing wrong with this bouncy classic my favourite version involves Jim Broadbent and Richard Roxburgh getting vampy and campy in Moulin Rouge…can’t be unseen. On and On by Erykah Badu from Baduism. Her youthful, liquidy voice and spirituality-infused lyrics make anything she does a total joy but if you’ve never heard anything before this beautiful song is a fine place to start. Rocky Racoon from The Beatles’ White Album, which is my favourite of theirs…one of my favourites, anyway. It was playing in some shop today and I couldn’t seem to shake it out of my mind (mostly because Tim wouldn’t stop whistling it.) I like how it’s so bizarre yet so old-fashioned sounding, like something you might have heard as a Sunday morning kids’ radio show and yet also rather sinister. And I like songs where animals are the main character. I just watched an amazing film called The Wrestler – that is, I was blogging while Tim was watching, I don’t know that I could really deal with this film without having something else to look at while the violent stuff is happening – and Guns N’Roses’ Sweet Child Of Mine plays during a fairly pivotal scene. I hadn’t heard this song in a while and it was refreshing to hear it in a new context, removed from its usual setting, straight after Living On A Prayer on the Music to Binge Drink To compilation. Is there a more joyful opening guitar riff than that which this song possesses? Next time: Hot cross buns, friend. That said, by the time I get round to blogging about them, Easter will likely have passed, the need the recipe will have gone, and you’ll probably be sick of the sight of them on every single food blog. Well I, for one, am excited. Squee!! I'm really rather terribly excited to hear you mention Rocky Raccoon – it's always been one of my favourites, and it's so rare to find people who a) know it and b) also think it's stellar. That cake looks gorgeous, and we have three trees worth of apples which need to be used before the waxeyes hollow them out & turn them into houses! Perfect! Rocky Raccoon! It's on the soundtrack of my youth! Can still rattle off most of it as long as there's someone else to join in so that it appears to be a legitimate song rather than me rambling madly. And, Guns 'n' Roses will always remind me of a certain baby sitter who 'rocked' you to sleep to those very same songs. That cake looks so simple that I think I'll try it myself. Woohoo for holidays! LOL that post title made me giggle – quite clever! I like this cake recipe, too! Happy Easter! yumz – so gonna make this. That's a great looking cake. Quinces are so hard, the thought of trying to grate them scares me!